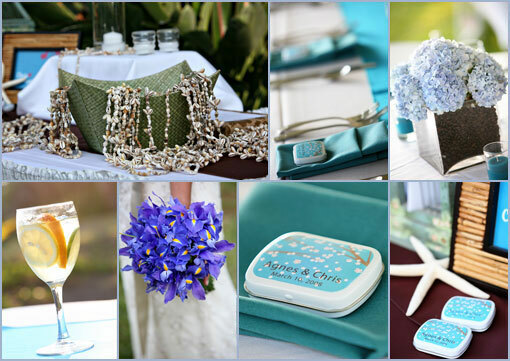 These details all come from a destination wedding in Kauai. Everything was absolutely darling! From the white wine sangria, to the bouquet, to the shell leis, to the personalized mint tins, and even the hydrangea in coffee beans! This wedding went off without a hitch thanks to Marlene Mira of Mira Mira Events. You can get your own personalized mint tins with custom graphics at Beaucoup for just $2.50 each. They also carry a plethora of other fabulous favors! The wedding chicks think that they are super cute! Beaucoup Wedding Favors, Inc. was founded with the mission of filling a gap in the wedding and party favors industry for unique and elegant favors. Beau-Coup.com’s strength in merchandising and its eye-catching website make it a valuable destination on the web for couples and families looking for one of a kind favors and gifts as well as an enjoyable shopping experience. Their online store is backed by a friendly and knowledgeable customer support team whose goal is to provide unparalleled service to help relieve some of the stress involved in wedding and other party planning.